A friend’s newspaper advertisement for a groom nets the most famous actor in London, Arthur Bex. Shy heiress Ester Croome proposes to elope with the handsome man, who she’s secretly loved for two years, in order to escape an impending engagement arranged by her overbearing family. Trying to outlive the shadow of his villainous uncle, Bex needs to marry quickly—to a woman of good character. And smart, beautiful Ester fits the bill. But a harrowing trip to Gretna Green and dangerous abolition rallies prove to be a more treacherous stage than either imagined. Infatuation and a mutual love for Shakespeare might not be enough to bind a couple looking to outrun the chains and secrets of family and the past. When her dear friend places a matrimonial advertisement and discovers that her correspondent is the man Ester has obsessed over for two years, she steps aside and lets Ester take her place. The shy and retiring Ester takes the bull by the horn and literally seizes the day. This story takes us on a journey to Gretna Green the hard way. Along the way, Ester’s mettle is tested. She’s been the coddled spoiled daughter of an affluent textile merchant her entire life. She was shielded from the vagaries and hatred her skin color engendered. It is an eye opening journey that calls upon her to rise to the challenge. Rise is exactly what she does. Her marriage allows her to grow up overnight and become a true help mate to the man of her dreams. Vanessa Riley incorporates true history into this fictional tale and weaves a fantastic love story. There are no weak characters in this series. They are all drawn with precision and allowed to shine in their own time. I can’t wait for the next in the series. Ester Croome has led a sheltered life and knows little about the gritty side of 19th century London. But when she comes face to face with the famous stage actor she’s been infatuated with for years, shy Ester makes a bold proposal. Arthur Bex is a successful actor and a passionate abolitionist in search of a wife. When he meets Ester, he is immediately smitten. He and Ester elope to Gretna Green but neither understand how dangerous it is to love in the time of abolition. 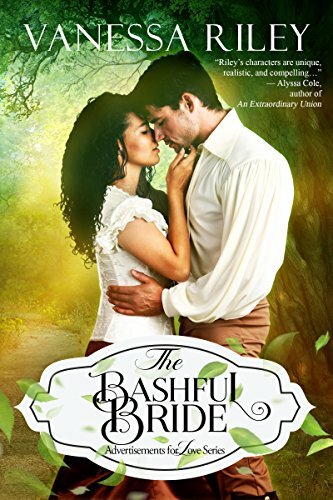 Vanessa Riley’s THE BASHFUL BRIDE was a gripping and beautifully told story. Definitely put this one on your list! Ester Croome is a Blackamoor woman in regency England whose father has just arranged a marriage between herself and a man she finds objectionable (mostly because she knows him to be a womanizer). To avoid the arranged marriage she elopes with Arthur Bex, a Shakespearean actor who has been answering advertisements in the newspaper looking for a match. But various obstacles stand between them and a successful marriage: Ester’s objecting family, Bex’s involvement in the dangerous abolition movement, and secrets from Bex’s past. I liked both Bex and Ester. One interesting element of their relationship was that while they agree to the elopement on their first meeting, they’re both plagued with doubts, which seems more likely than them just being gung-ho about it all the way. I loved all of Ester’s insecurities because of her family–her worries that someday her husband might cheat on her, her resolution not to be “a couch wife” who just sits back and lets her husband do as he will but to be actively involved in their life. And I also liked that in the areas where she seems the most self righteous, she ends up taking a step back and admitting she might be wrong. On the other hand, it often felt like this book kept on going back over the same ground. The trip from London to Gretna Green is covered in great detail, and Ester and Bex both keep on going back and forth and back and forth on whether this is a good idea, whether they should turn back, etc etc. While it’s realistic, it’s the sort of internal struggle that I’d rather see more in brief than drawn out. In fact, the book is two thirds over by the time Ester and Bex actually get married, and while some of that time is spent on reasonable considerations and interesting interactions with Ester’s family, a lot of it feels like filler. However, those parts still provide valuable character insight I suppose, and the last third is fun, wrapping up all threads left hanging and providing a plot about Bex’s involvement with abolitionists. Speaking of which, one highlight of this book is how it examines racial relations in the time period: the prejudice often shown against even Ester, who is Blackamoor but relatively wealthy and well-to-do, and the hostility towards the abolition movement. To be honest, this element was what interested me in this book initially, and it certainly followed through. So the multicultural element was good. Overall, I’d say it comes across as more historical than many historical romances, and the relationships are interesting, but it does drag at parts. I’d recommend but with qualifications. I received an ARC through Netgalley in exchange for an honest review.